Using some combination of wider channels or additional spatial streams (there isn’t enough available bandwidth to do both), improved beamforming, and other techniques, Wave 2 802.11ac routers will deliver maximum physical link rates in the range of 7- to 10Gbps. Quantenna Communications announced its first Wave 2 802.11ac chipset last April. 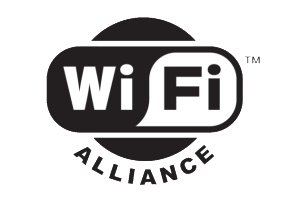 In a recent briefing, the Wi-Fi Alliance’s VP of Technology Greg Ennis said the IEEE anticipates the 802.11ac standard will be succeeded by 802.11ax. While the standards body doesn’t expect to ratify it before March 2019, products based on a draft of the standard could reach the market as early as 2016—just as we saw draft-802.11n and draft-802.11ac products before those standards were officially ratified. 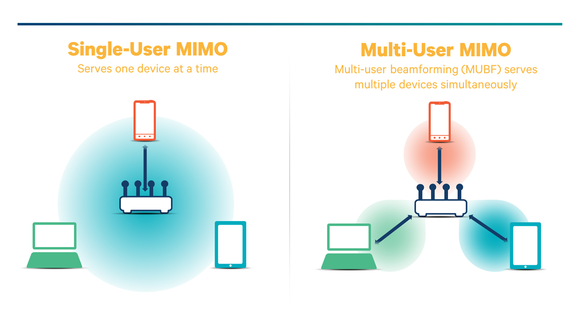 One of the top objectives of 802.11ax, according to Ennis, is to quadruple wireless speed to individual network clients—not just to increase the speed of the network overall. 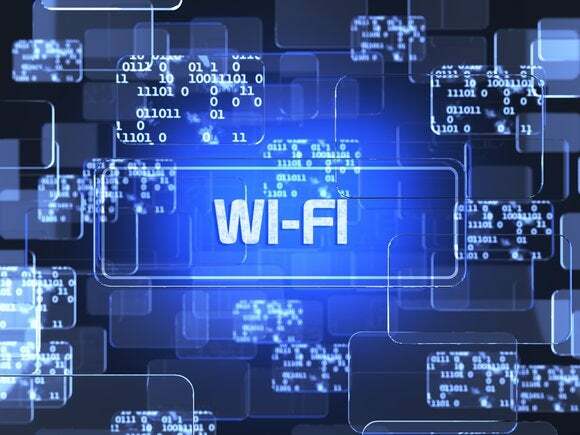 The Chinese manufacturer Huawei, which has engineers in the IEEE 802.11ax working group, has already reported Wi-Fi connection speeds up to 10.53Gbps on the 5GHz frequency band. Ennis said the 802.11ax standard will improve Wi-Fi performance in environments with high numbers of users, such as hotspots in public venues. This will be accomplished by using the available spectrum more efficiently, doing a better job of managing interference, and making enhancements to underlying protocols such as medium access control (MAC) data communication. This should make public Wi-Fi hotspots faster and more reliable. 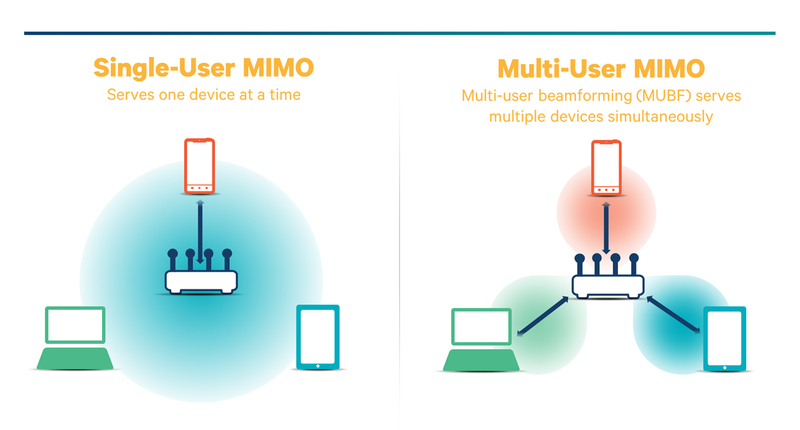 The 802.11ax standard will also use orthogonal frequency-division multiple access (OFDMA) to boost the amount of data the router can transmit. Like OFDM (orthogonal frequency-division multiplexing), OFDMA encodes data on multiple sub-carrier frequencies—essentially packing more data into the same amount of air space. The “multiple access” in OFDMA describes a means of assigning subsets of those sub-carrier frequencies to individual users. While one segment of the IEEE works to define the successor to 802.11ac, other factions work on two complementary wireless-networking standards that address other needs. The IEEE 802.11ad standard uses unlicensed spectrum in the 60GHz band to build fast short-range wireless networks with peak transmission rates of around 7Gbps. There are two major drawbacks to transmitting data at 60GHz: One is that the extremely short waves have difficulty penetrating walls. Another is that oxygen molecules begin to absorb electromagnetic energy at 60GHz. Dell's Wireless Dock D5000 operates a short-range network on the 60GHz frequency band to eliminate the need for display, mouse, keyboard, and audio cables. That explains why the relatively few 60GHz products to reach the market so far are designed to operate at very short range, or within a single room. Dell’s Wireless Dock 5000 is a good example of the former, and the DVDO Air—which streams HD audio and video from a Blu-ray player to a video projector without a cable—is a great example of the latter. The IEEE 802.11ah standard, meanwhile, literally resides at the opposite end of the spectrum. Operating in the unlicensed 900MHz frequency band, a wireless network based on this would easily penetrate walls, but it wouldn’t deliver a lot of bandwidth: anywhere from 100Kbps to 40Mbps. One use case might be for sensors and probes in connected home or commercial buildings, but the IEEE isn’t expected to ratify the standard until January, 2016. 802.11ah could be considered a competitor to the Z-Wave and ZigBee protocols in the Internet of Things space. What with 802.11ac, -ad, and -ax, the future of Wi-Fi looks a lot like alphabet soup. But it's really the evolution of Wi-Fi into standards that fit the demands of new generations of wirelessly connected devices. When those new generations contain everything from enterprise printers to egg timers, you can bet there'll be needs for all the flavors of Wi-Fi coming down the pike. This story, "What’s next for Wi-Fi? A second wave of 802.11ac devices, and then: 802.11ax" was originally published by PCWorld.